In Kenya, at the field station set up in Nairobi city, I met a graduate Student of ASAFAS, Mr. Naoki Naito (year of enrollment: 1999) to have discussions together with Itaru Ohta (ASAFAS faculty) on methods for surveys and problems related to his research on pastoral people in the dry zone of northern Kenya. 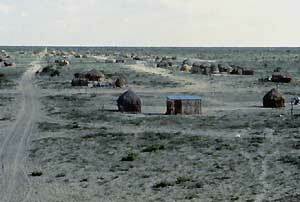 Mr. Naito is conducting ecological and anthropological studies on the Ariaal, who live in the semi-arid Marsabit district. While elucidating their environmental awareness and livelihood structure, he is studying their ethnic identity by observing their relations with two other peoples, the Samburu and the Rendille, and the details of the negotiations between these groups. In Botswana, I visited the study site of another student of ASAFAS, Ms. Junko Maruyama (year of enrollment: 2000), at the New Xade resettlement site for Central Kalahari Bushmen, which was established in 1997. I discussed problems and the method of her survey with her. Ms. Maruyama has been surveying the livelihood and behavior of people in a process of transition from a nomadic hunter-gatherer lifestyle to a settled cash economy lifestyle at a government-led resettlement, based mainly on anthropological participant observation. From now on, she is planning to carry out comparative studies in two or three other settlements in the area, and complete her doctoral dissertation.